I love eating pies, however, once a nice big pie is fresh out of the oven, the wholeness of it becomes destroyed by the slice of a knife. 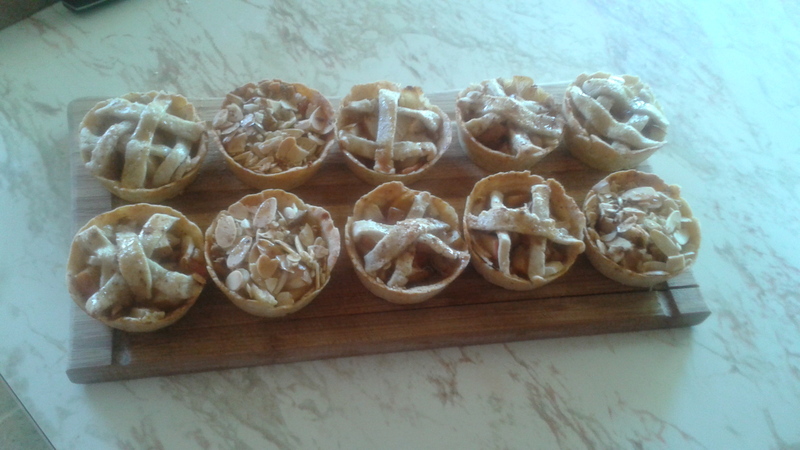 Therefore, sometimes I opt instead to make mini pies. They are super easy to make and you can experiment with various flavors, fillings and top crust designs all in one baking batch! For this recipe, you will need a food processor, cupcake pan, rolling pin, knife (or pizza cutter), large saucepan, measuring cups and measuring spoons. In a food processor, pulse dry ingredients (flour, almond meal and salt). Manually pulse about 3-5 times until dry ingredients are blended together. Slowly add in ice water, while pulsing an additional 5-7 times. The mixture will look crumbly, however, should stick together when formed into a ball. Remove dough from food processor and form into a large ball on a clean surface. Use a rolling pin to flatten out the dough. Let dough set, while preparing the filling. In a large saucepan, heat approximately 2 tablespoons of butter on medium heat. 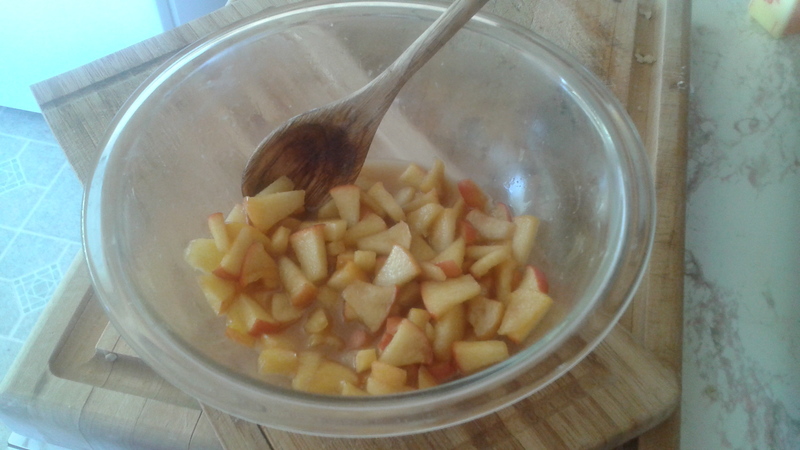 Add diced apples and pears, stirring constantly, ensuring that the the fruit is being coated in butter. Add brown sugar and white sugar. Continue stirring. Add more butter, if necessary in order to keep the fruit moist. In a large bowl combine butter-coated fruit from saucepan. Add cinnamon and vanilla bourbon. Add cornstarch to create a thickened consistency. Focus your attention now back to the dough. 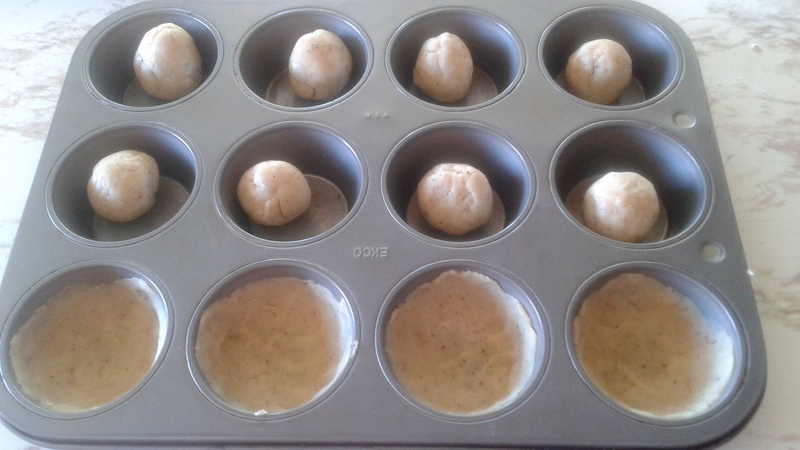 In a cupcake pan, grease each individual pan with butter. Evenly disperse and place mini balls of dough into each individual pan. Leave 1/4 of the dough behind for the non-lattice top crust. 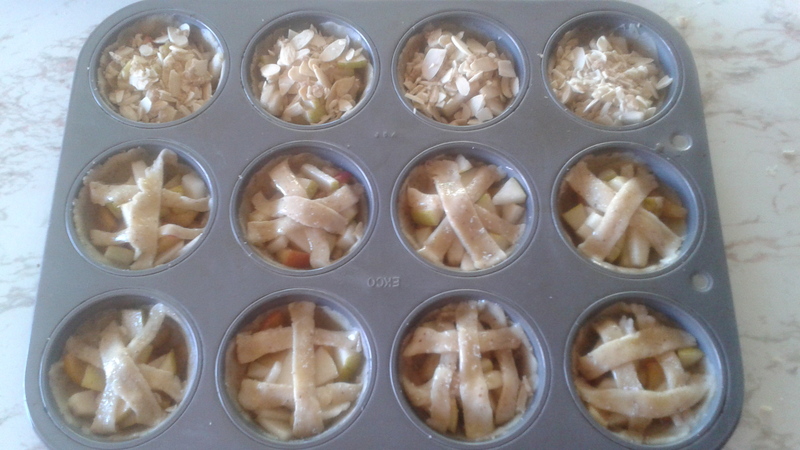 Using your thumb and fingers, flatten each mini ball into the shape of a pie crust. Add pie filling to each mini pie. With leftover dough, create lattice (or in my case, non-lattice) top crusts. Use a knife or pizza cutter to cut out strips of dough. 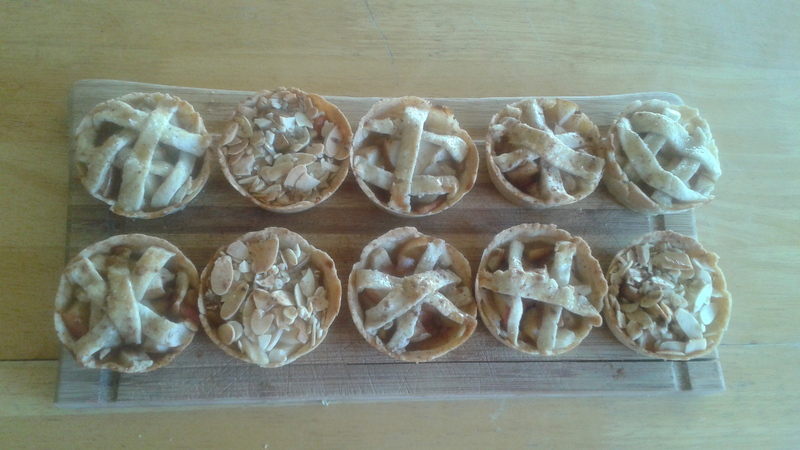 I accidentally ran out of dough, so I also used toasted almonds as a top crust alternative to a few of the pies. Sprinkle some sugar on top of each pie then use an egg wash (aka a whisked egg) to seal each top crust. Bake in the oven for approximately 20-30 minutes, or until the edges of each pie looks golden brown.